Boffins have fashioned an artificial bio-engineered jellyfish from rat cells that could one day fix up badly damaged human heart tissue. Researchers from Harvard and Caltech working towards building an artificial human heart cobbled together some silicon and some living rat heart cells to make a jellyfish that can pump through liquid. 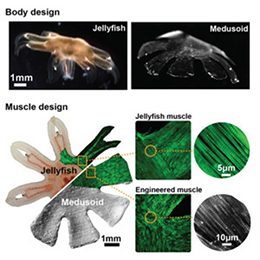 The boffins reckon the jellyfish, believed to be the oldest multi-organ animal in the world, is a good model for a heart, because their basic function is the same, they're both muscular pumps. "It occurred to me in 2007 that we might have failed to understand the fundamental laws of muscular pumps," Kevin Kit Parker, professor of bioengineering and applied physics at Harvard and co-author of the study, said in a canned statement. "I started looking at marine organisms that pump to survive. Then I saw a jellyfish at the New England Aquarium, and I immediately noted both similarities and differences between how the jellyfish pumps and the human heart. The similarities help reveal what you need to do to design a bio-inspired pump." In order to build their fake jellyfish, dubbed Medusoid, the scientists used a silicon polymer, moulding it into a thin membrane with eight appendages. They then printed a protein pattern on the membrane as a roadmap for the growth and organisation of the rat tissue, which makes up the muscle architecture of the jellyfish. “I was surprised that with relatively few components - a silicone base and cells that we arranged - we were able to reproduce some pretty complex swimming and feeding behaviors that you see in biological jellyfish,” said John Dabiri, a professor of aeronautics and bioengineering at Caltech and the co-author of the paper. The boffins reverse-engineered the arrangement of the cells by making maps of the alignment of sub cellular protein networks in a Medusa jellyfish's muscle cells. They then dropped Medusoid into a container of saltwater and shocked it into swimming just like the real thing. Now that Medusoid can swim, the researchers want to try to make it evolve, giving it a simple brain so it can respond to its environment and do things like head toward light sources or seek out its own food. Apart from the potential to accidentally create a race of super-smart rat-jellyfish overlords, getting Medusoid to think for itself could show how biological or cyborg pacemakers could be created that can live in the human body for long periods of time without needing batteries. "We're re-imagining how much we can do in terms of synthetic biology," Dabiri said. "A lot of work these days is done to engineer molecules, but there is much less effort to engineer organisms. I think this is a good glimpse into the future of re-engineering entire organisms for the purposes of advancing biomedical technology."